Prepare high-quality disk specimens from thin metal foils with the EMS 130 Specimen Punch. 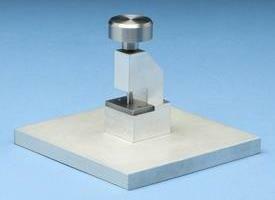 A precision ground punch and die plate eliminate specimen stress and distortion. For convenient handling, a spring-loaded return plunger keeps the disk specimen on the die plate surface. Available with a wide or standard base and in three sizes. Place the punch on a solid surface. Center area of sample interest under the punch. 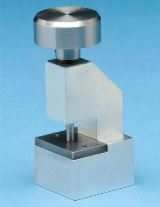 Lower punch to specimen surface and evenly apply pressure to punch specimen. It is permissible to use a small hammer to strike the knob. Pull up on knob to expose punched disk. Gently pull up on knob until specimen blank can be removed from the punch.